Sew Inspired: I won! and a giveaway. 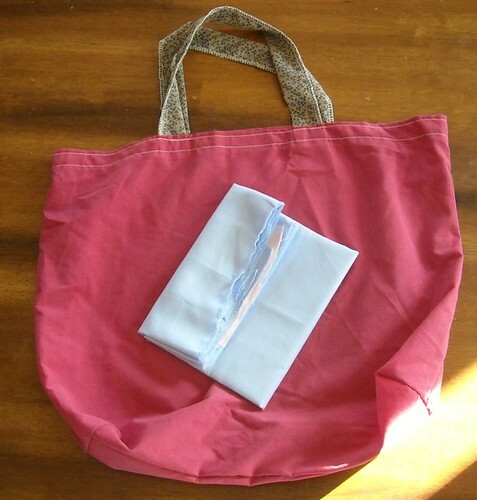 I won one of 100 bags given away by the folks at Green Bag Lady for the recent Sew, Mama, Sew giveaway day. My prize included a sewn fabric bag, and fabric to make another bag for me to give away. So... I'm going to give the bag that I sew (from the light blue fabric) away to a lucky commenter here, along with fabric, still undetermined, from my stash to make another fabric bag for the winner to give away. You can enter by posting a comment here. I'll close comments and draw a winner Friday afternoon or evening. Please only enter if you are willing to sew up a bag to give away! winning is fun and making a bag to save the landfills is even more fun. Put my name in the drawing please. Sounds like fun! I love bags-keeping them or giving them away! I would love to win a bag and give one away too;) Congrat's on your winnings! How fun that you won! I bet the bag you make will be adorable! Bags are my favorite thing to make. It's like a pay-it-forward, what a great idea! How do you do. Found your delightful blog compliments of Park City Girl! Congratulations on your win. I look forward to catching up on your blog! I entered that giveaway and didn't win. I would love another chance. We use cloth bags all the time and would love another and I would definitely make one to pass on to someone else. What a nice giveaway! Paying it forward is a great concept and I would love to make a bag for someone! I love your blog and I came across it today by way of Park City Girl. I'm adding you to my google reader! Your stocking is fabulous and I'm itching to make one! Alas .... too many Christmas gifts needing their finishing touches. Gotta go sew some binding! What a great idea, on so (sew) many levels. Play it forward. What a fun giveaway. Please put my name in the drawing! Just came to your blog from parkcitygirl. What a great giveaway, I'd love to make a bag for someone else! such a cute idea! I think I will make a bag anyway and give it with some fabric for someone to pass along. so fun! Oh this is like a PIF...I would love to entered into your give a way...Happy holidays.